Among the sprinkle of Williamsburg hotels on offer, it is the Wythe Hotel that has best captured the spirit of the area. The property’s interior design is like Brooklyn herself: uber hip, yet oh so understated. Mid-century modern and nature-inspired motifs play nicely in the industrial setting of a former textile factory. And you can’t really improve on the location: a few blocks from the subway and McCarren Park, but close enough to the waterfront to afford amazing city skyline views. The rooms are tastefully decorated with cozy touches like exposed pine ceilings and vintage-style wallpaper. Extras include radiant floor heating, a well-stocked mini-bar featuring Brooklyn beer labels, luxurious, locally-made bath products from Goldie’s, and free wifi. You’ll be perfectly comfortable in a standard king or queen room, but you may also consider a bunk room (designed with traveling musicians in mind), or a high-roller loft space with a separate seating area, pedestal tub, and 360-degree views. Even if you are not staying in one of the Wythe’s 72 well-appointed guest rooms, you can enjoy the cool vibe in their Euro-casual restaurant, Renard, or take in the scene at The Ides rooftop bar. More reasons to stop by this perfectly Williamsburg hotel include their innovative film series, art shows, and Brooklyn-makers popup shops. 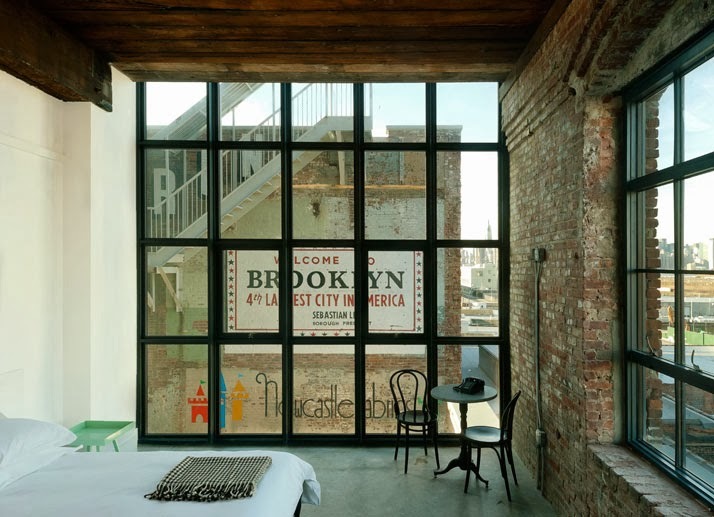 80 Wythe Ave., at North 11th St., Williamsburg, Brooklyn; 718-460-8000; L Subway to Bedford Ave.; rates start at $179; website: http://wythehotel.com.